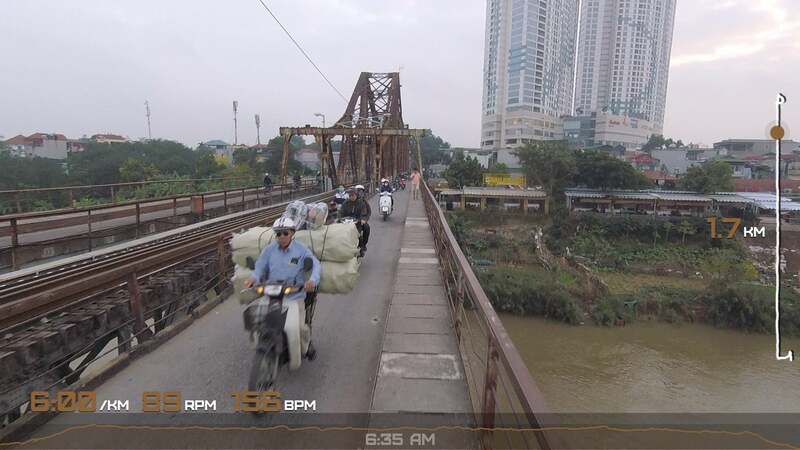 Running the Long Bien Bridge (Hanoi, Vietnam) | JustRunLah! 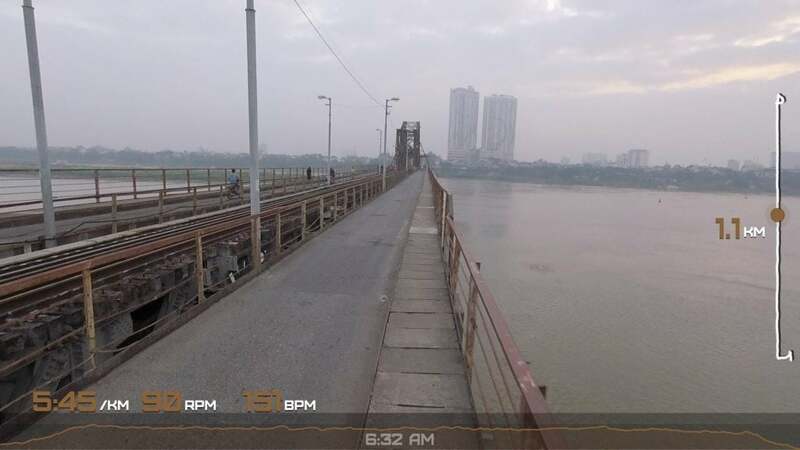 When in Hanoi especially near the Old Quarter and looking for a place to run, you’ll likely end up running loops around Hoan Kiem lake (almost 2km) or doing a huge one around West Lake (17km). But its actually not hard to run on the streets there in the early hours. Mornings are the same as in any other place when you start on the blue hour – a lot less traffic – so you might as well do your own exploratory or touristy loop. 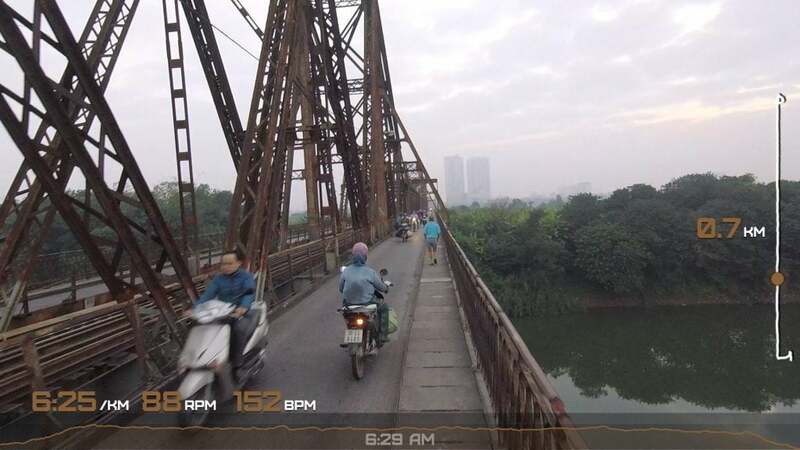 While you’re at it, go swing by the Long Bien bridge, not just to see it and take pictures but to actually run through it. Its a rusty cantilever bridge that is likely older than any living grandma you know personally. Built by the French during their occupation of Indochina, it flies a mile (1.68km span) over the Red River and was one of longest in Asia at the turn of the 20th century. Trains run in the middle while motos and bicycles ply on either side. It can be crossed on foot but can be nerve wracking. Footpaths are on the outermost side each way. The thin and rusty railings hardly gives much cover that a toddler can easily fall through, then at some parts they were as as high up to my hip only. Not at all advisable to traverse on bad weather or strong winds. Not even sure if the railings will hold up when leaned on hard enough or it ever get hit by a moving vehicle. Its unsettling enough to see too much of the water below, the railing in this part is just up to my hip. The path itself is just lined up cement square tiles only about 4cm thick, and seems secured only by place holders. There are gaps between that you see what’s at the very bottom, because there’s nothing else under those tiles. With the rather open railing and the repeating peek-a-boo gaps below your feet, it gets unsettling when you are at the highest point and its water all around. It is also just comfortably wide for 1 person only. If you run into someone, both have to twist a bit to not bump shoulder, or stray briefly into the path of the riders to overtake. Yes, there’s no physical barrier between pedestrian and wheeled traffic, except that the footpath is elevated like a street sidewalk. You need to watch out for those riders hauling cargo that may stick out their sides. And this being Hanoi, some riders will go counter-flow even on this bridge when its already not wide enough for 3 riding abreast safely. 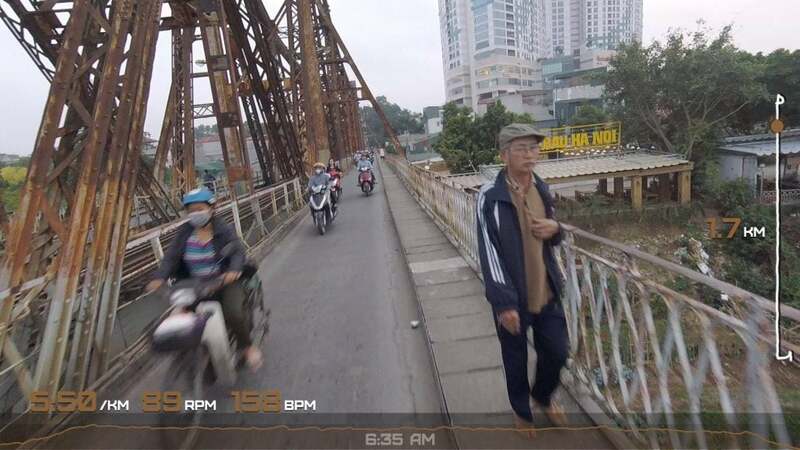 Straying into the path of oncoming motorcycles to pass by the guy going the opposite direction. So why hassle yourself to run it at all? To get yourself transported back in time I guess? 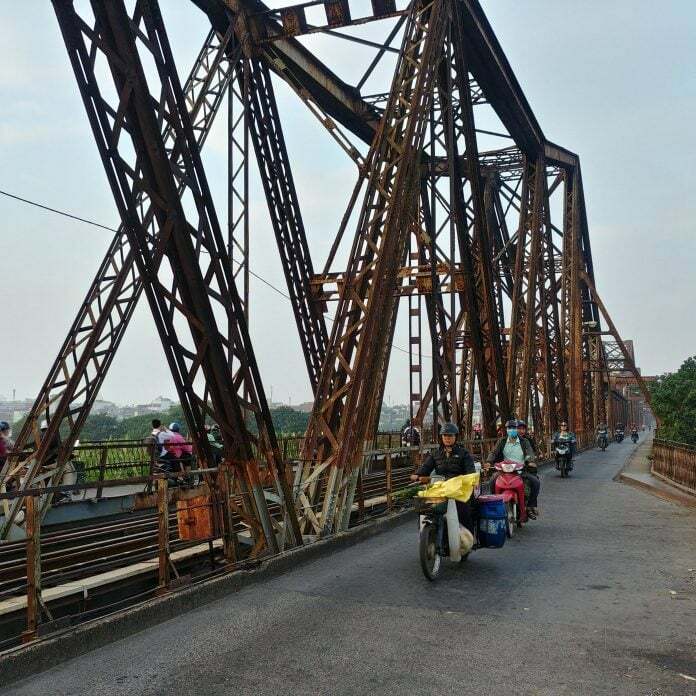 Imagine how people in the 1900s felt when they saw this bridge, surely it was a marvelous sight to behold for everyone, probably akin to seeing the Eiffel Tower but in Indochina. You can’t feel the same way now, but for the last intervening 120 years it was witness to a lot of events and changes in the world and also became part of it. It definitely transformed communities near and far with the people and goods it helped transport It became an vital participant in wars, and thus was sitting duck target as well. In its existence for over a century, imagine generations within the same family now, from great grand parents to the youngest kids telling stories of different lifetimes and eras but with the same old bridge as a backdrop. If this bridge was an actual grandma now, it would be enjoying with her great grand children memes and GIFs from the /r/NamFlashbacks. 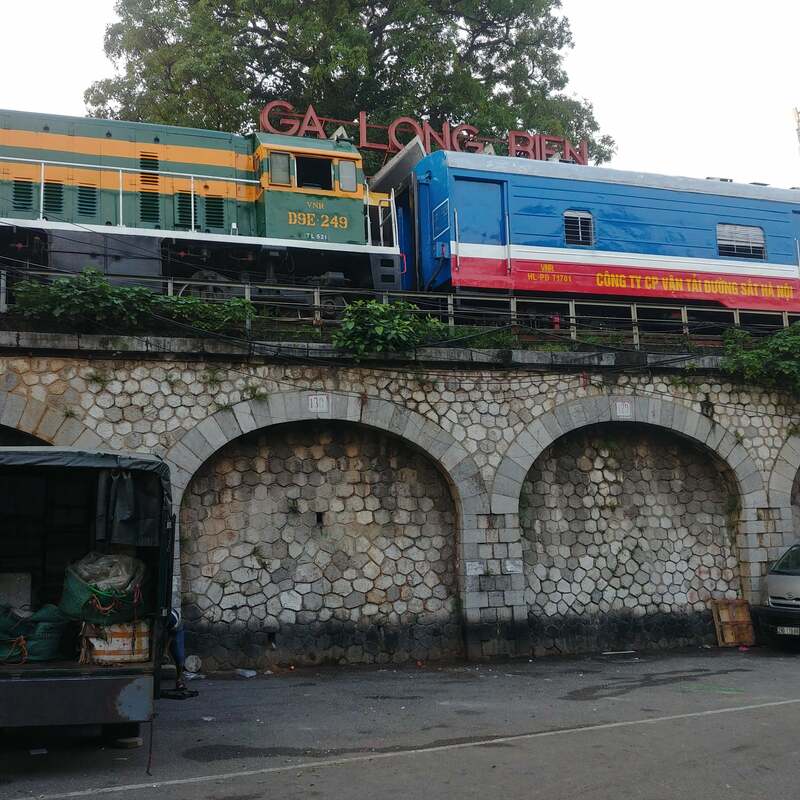 Just at the edge of Old Quarter, a train wait atop the viaduct at Long Bien train station before it crosses the bridge. For whatever reason that got you there – the stories, the romance, or otherwise – either way, don’t be that guy who had to leave mark (grafitti/vandalise) or pluck a piece as a remembrance just because its a worn down relic. You want to be part of its history? Just run it end to end, there’s a Strava segment leaderboard there waiting for your name.